The Building and Construction Authority (BCA) of Singapore has reviewed its 3rd Green Building Masterplan, which was released in 2014. New initiatives based on the review will be rolled out in phases for enhancing the indoor environment quality for occupants, encouraging high energy efficient buildings and greening existing buildings and spaces. 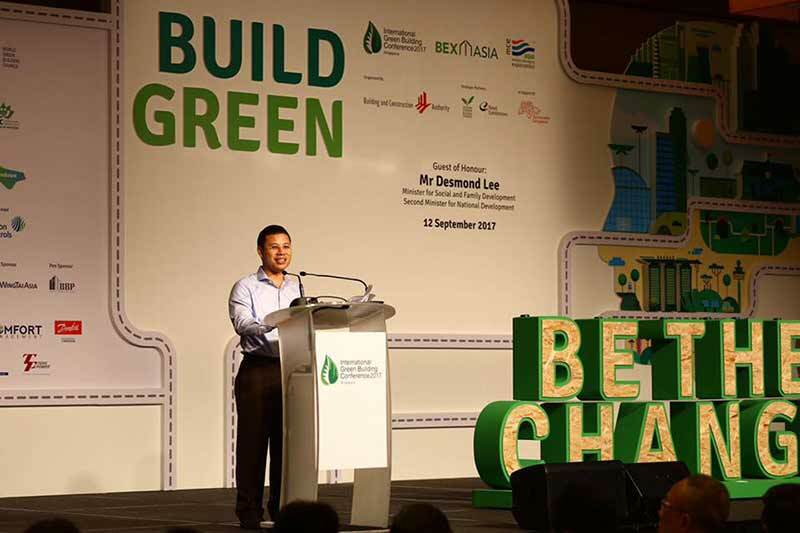 The announcement was made by Mr. Desmond Lee, Minister for Social and Family Development, and Second Minister for National Development, at the opening of the Singapore Green Building Week (SGBW) 2017. The BCA Green Mark was launched in January 2005 as a yardstick to rate the environmental sustainability of buildings in the tropics and to stimulate the growth of green buildings in Singapore. It aims to set parameters and establish indicators to guide the design, construction and operation of buildings towards higher energy efficiency and enhanced environmental performance. BCA initiated a research study in 2014 in collaboration with National University of Singapore (NUS) to investigate Indoor Environmental Quality (IEQ) performance in BCA Green Mark buildings in comparison with buildings without the certification. The study found that, besides being more energy efficient, BCA Green Mark buildings also provide a healthier indoor environment for its occupants. The study observed that occupants in Green Mark buildings were more satisfied with their indoor environment and were less likely to experience sick building syndrome (SBS) symptoms. The results of the study will help BCA refine its criteria for future BCA Green Mark schemes. The last version, Version 3, was implemented in 2012. To start with, BCA will pilot a new set of criteria for the Green Mark for Existing Non-Residential Buildings (GM ENRB: 2017) scheme for one year, which include enhanced requirements for building owners to improve the IEQ for its occupants and adopt smart control systems to operate the buildings. For instance, smart building controls and strategies are being introduced in GM ENRB: 2017 in the areas of energy monitoring, demand control, as well as integration and analytics. GM ENRB: 2017 also promotes good practices such as the use of high-efficiency filters in air distribution systems and permanent sensors to monitor indoor air pollutants, such as formaldehyde and particulate matters. Other highlights of GM ENRB: 2017 include encouraging solar adoption and awarding credit points to buildings for engaging SGBC-accredited Energy Performance Contracting (EPC) firms to implement energy improvement works with an energy performance contract, and maintenance of chilled water air-conditioning and air distribution systems’ efficiencies through a performance based maintenance contract. GM ENRB: 2017 also hopes to encourage building and facility managers to measure and understand the performance of their air distribution systems and take actions to improve or maintain the system efficiency. BCA is exploring with the HPB the development of a new Green Mark scheme to encourage good designs such as the provision of energy efficient lighting and office equipment (the “hardware”) as well as the development of workplace health-related programmes (the “software”) to encourage healthy practices amongst office occupants. The new scheme aims to get companies to consider the health and well-being of their occupants when designing both interior fit-outs and provisions of the offices, as well as the workplace health programmes and policies for the workers. More details of the joint scheme will be made available in mid-2018. Since 2013, BCA has progressively required commercial buildings, healthcare facilities and educational institutions to submit building information and energy consumption data annually. The latest findings show a 9% improvement in the overall Energy Use Intensity (EUI; measured in Kwh/m2.yr) of these buildings in 2016 compared to 2008, with more significant improvement over the last five years. To allow building owners to be aware of their building’s energy performance vis-à-vis other buildings of similar types, this year BCA will disclose the energy performance data of commercial buildings, whose owners have voluntarily agreed to publicly disclose their buildings’ data. This will cover about three-quarters of all commercial buildings in Singapore and is a follow on from last year’s round of anonymised disclosure. Such data disclosure aims to encourage building owners and facilities managers to consciously adopt cost-effective measures for their buildings and also with their tenants, to reduce the energy footprint of their buildings. The energy data is made available on BCA’s website and Singapore’s open data portal, data.gov.sg. BCA will next be approaching healthcare facilities and educational institutions to voluntarily disclose their energy performance data from 2018. It is hoped that greater transparency of building energy data will increase demand for green buildings and its related services and create more market opportunities both locally and regionally in areas such as energy audits and environmentally sustainable design for green building firms. The availability of building energy performance data could also spur the research community and companies to study ways to advance green building solutions in Singapore and the region. The continued growth in demand for green building design and technologies has been identified as a key trend in the Construction Industry Transformation Map (ITM) which is currently being developed. To meet the increasing demand for green buildings, BCA has revised its target to train 25,000 green building professionals by 2025 (from the previous target of 20,000 by 2020). To date, about 16,000 professionals, managers, executives and technicians (PMETs) have been trained by the Institutes of Higher Learning, BCA Academy and the industry associations. In 2016, BCA shared the aspiration of achieving Positive Energy, Zero Energy and Super Low Energy Buildings (PE-ZE-SLEB) in Singapore. To examine the opportunities and challenges of implementing PE/ZE/SLEB, BCA embarked on a study on the PE-ZE-SLEB Technology Roadmap since 2016. This study aims to map out pathways towards achieving PE-ZE-SLEB via development, demonstration and application of technologies, with a focus on cost-effective and implementable solutions. A consultative approach has been adopted with multiple industry consultation sessions, stakeholders’ roundtable workshops and surveys. The study was conducted in collaboration with research institutes NTU-ERI@N (Nanyang Technological University- Energy Research Institute) and NUSSERIS (National University of Singapore- Solar Energy Research Institute of Singapore) and industry partners, with funding support from the Green Buildings Innovation Cluster (GBIC) and National Research Foundation (NRF). BCA plans to seek further comments from the local and overseas experts at the IGBC-Roundtable Discussion Workshop. SBS describes a situation in which the occupants of a building experience acute health- or comfort-related effects that seem to be linked directly to the time spent in the building. Roadmaps are being developed for 23 industries to address issues within each industry and deepen partnerships between Government, firms, industries, trade associations and chambers. The ITMs are grouped into 6 broad clusters: Manufacturing, Built environment, Trade & connectivity, Essential Domestic Services, Modern services and Lifestyle.